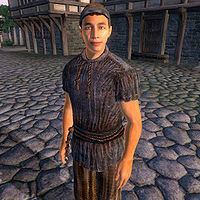 Nermus the Mooch is an Imperial beggar living in Chorrol. His bedroll and food sack can be found behind the Chapel of Stendarr, among some large rocks. He lives a hard life and spends most of his day visiting various locations around town, occasionally addressing the townsfolk for a few pieces of gold. He wakes up early at 6am and heads to the southern gate and begs there for four hours. After having tried his luck here, he will move to the north gate at 10am and continue his begging for four hours. At 2pm he will relocate to the area in front of the Chapel of Stendarr and try to convince someone to help him for another four hours. At 6pm he will return to his bedroll and just stroll around until his bedtime at 10pm. His attire includes a sack cloth shirt combined with coarse linens. As a beggar he can't afford weapons or spells, relying on his bare fists during combat. You can catch the disease Wither from him. He can give you hints as how you may find the secret association of the Thieves Guild. He, along with Lazy Kaslowyn, only has an Al package to find food not to eat it, even if there is food in his sack and thus he will just stroll near his bedroll until his bedtime.